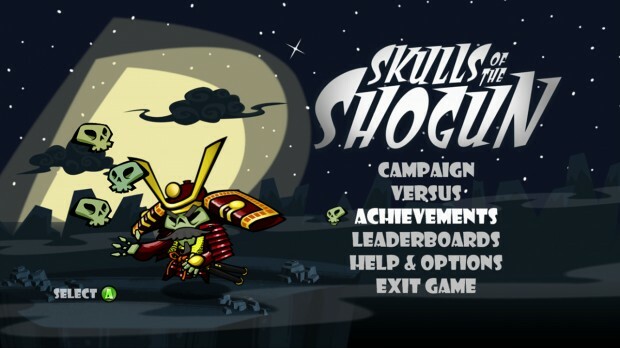 Welcome to the first part of the XBLA Fans exclusive guide to 17Bit’s fantastic new strategy game, Skulls of the Shogun (Skulls.) Within this section of the guide, you’ll find a range of killer strategies, hints and tips which will help you get started. We’ll be adding complete guides for every level and each and every one of those coveted Gold Skulls over the next few days. The first thing to do at the beginning of any Skulls battle is to survey the battlefield and figure out where everything is. You’ll want to do this thoroughly, because most of the maps in Skulls feature a range of enemies, shrines, rice paddies, potions and often more. Obviously you’ll also need to take in any choke points, bridges, ridges, bamboo cover etc, as these factors will certainly affect the way your troops move across the battlefield. This is a simple one, but it’s worth making a mental note of what happens when units face each other. When an archer attacks a cavalry unit (for example) then the damage caused will always be 4. This is because whilst the archer does 6 points of basic damage, the cavalryman’s defence score of 2 mitigates 2 of those damage points. When an infantry unit attacks another, he will cause 2 damage and receive 1 in return. Any unit which is at less than 50% of default six HP will attack with only half strength, so think carefully about whether using such a unit to attack is even worth it when retreat may be a better option. Similarly, it’s worth recalling the abilities of any monk units in your army. Fox monks heal and buff your troops, Salamander monks cause decent damage and allow you to summon the unpredictable Oni, whilst crow monks are support units with a useful (and deadly) wind attack, as well as the ability to steal rice from nearby paddies. All are useful in the right situation, so don’t overlook them without carefully considering the situation and terrain at hand. 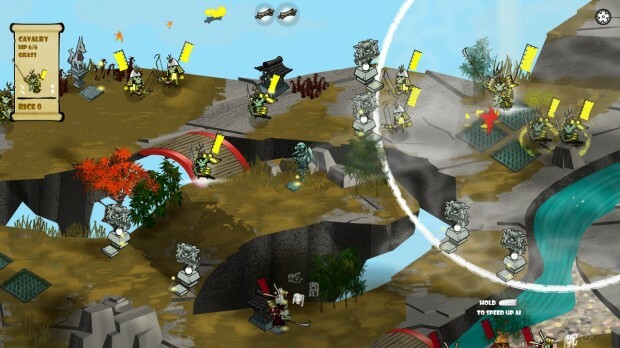 Unlike most turn based strategy games which allow all in-play units to take an action, Skulls only allows each General to order five units on his turn. In addition, whenever a new unit is brought into play via a summoning shrine, then that counts as an order. This mechanic means that more often than not, you’ll need to choose carefully which units to move and which to leave as they are. 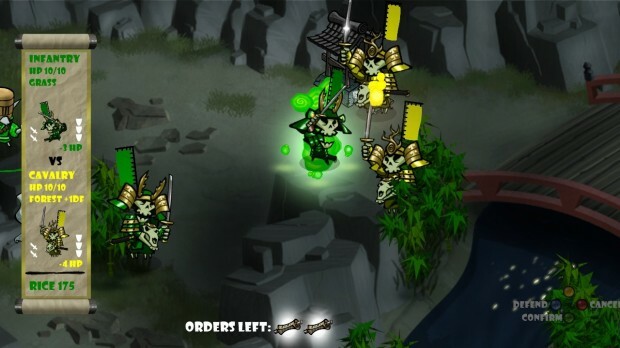 At the start of each game (especially in the campaign mode) Skulls will usually place a number of Shrines and Rice Paddies which can be reached by each of the opposing armies. There will also be some assets which are either in range of both teams, or just outside the edge of reach. These assets are often the key to victory, so try checking the movement range of both your units (cavalry especially) and the closest enemy units, to see if you have any way of reaching a more remote asset first. Although a good plan made early is often crucial, it is just as key that you plan your turns carefully later in the game. With more than 5 units in combat range, you need to maximise the damage you cause, whilst also considering the importance of capturing assets like skulls and shrines. The action prioritisation section below explains how to do this. Because Skulls features a broad range of maps, each of which has numerous areas of strategic value, it’s important to learn how to position your units to benefit you most. You’ll soon notice that it is often possible to move a unit after it has attacked or taken an action. Use this to your advantage, by keeping your units away from chasms and streams, or by using the extra movement to form a spirit wall with other units. These tactics either reduce or completely negate (for the former and latter) the chances of having your unit knocked back off the edge which will result in an instant kill. Similarly, keep your eyes open for opportunities to knock exposed enemies off ledges. 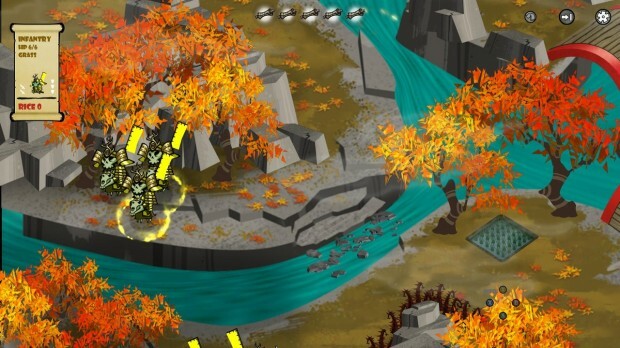 It’s also worth noting at this point that line of sight applies in Skulls, so if you have the movement range available and nothing else to do, you should try to either place some scenery between you and the enemy (especially archers) or hide units in bamboo groves for a 20% chance to dodge any attack. The final point for this section is that any unit who waits out there entire turn on a captured shrine or an active rice paddy will regain 2 HP. This can be invaluable when standing your ground or trying to haunt any structure which is contested between only one unit on each side – because effectively the unit who haunts and holds the structure first will continue to regain health following an attack. In the heat of battle and considering that you will only be able to move 5 units (or take 5 actions) per turn, it’s extremely important to prioritise what you do. Because of the relatively high importance of all units to the enemies cause, destroying enemies whilst receiving as little damage as possible in return should always be your highest priority. If you spend all 5 of your actions on harming enemies but finish none, then you probably should have focussed in on just 1 or 2 enemies and gone for the kill. The enemy General is always the highest overall priority, but (for example) killing an enemy infantryman (particularly one with skulls or a potion to power him up) is still usually more worthwhile than just harming the General for 1-2 points. This is because on the next enemy turn, he will have one less unit to attack with (or upgrade to a Demon) and chances are, he won’t have the spare rice (or willingness to use an order) to summon another infantryman. Enemies who can’t fight back (especially those haunting something) are an excellent target, because not only will your unit not receive damage in return (and remember if the enemy drops below 25% health their combat effectiveness is halved for the next turn) but if you make the kill, you will prevent them from capturing whatever it is that the unit was haunting. Assuming you have considered what can be achieved in terms of killing enemy units; your next strategy should be to capture skulls. The next section of this guide explains skulls in detail, but basically they can be used to increase the power ang longevity of your units. Eating a skull when you have nothing else to kill is a no-brainer really and even in battle, the boost to HP which your unit will receive could even allow you to eat an extra attack, thus causing your opponent to waste an order at no true cost to you. Also, don’t forget that any unit that eats 3 skulls will become a Demon, which bestows upon it a hugely valuable additional action on each turn. The prioritisation you should give to having a unit eat a skull also applies to having them consume a potion, as the effect will be a permanent boost to HP (green) or attack damage (red) either of which represents a useful, permanent effect. The last thing to consider when dishing out orders is probably when you should or should not haunt. Very early in the game, chances of killing (or even fighting) an enemy are low, so you can usually haunt structures freely. Summoning, Cleansing and Monk Shrines should be given highest priority, with rice paddies probably coming in last unless you’re really desperate. We’d recommend that you always aim for the structure (or field) which is furthest from your starting location, but not so far that the enemy will certainly (or more than likely) be able to kill the unit that you send. This is a balancing act between the importance of extending your control of the battlefield (and denying your enemy valuable assets) whilst also protecting your units from advancing into mortal danger. 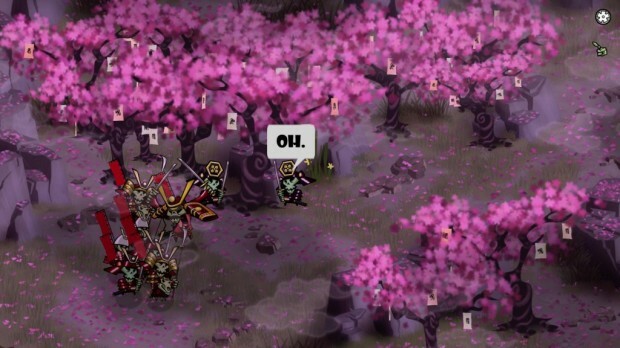 As a wonderful built-in nod to the title of the game, it is in fact the skulls of fallen enemies which provide the most unique tactical twist to Skulls of the Shogun’s gameplay. Consuming a skull uses a unit action and early in the game, you will struggle to come to terms with the idea that the game is asking you to choose either to attack, or to consume a skull, but not both. Despite the possibility of this initial reluctance, you’ll soon realise that by consuming 3 skulls, your units will upgraded to Demons, who are not only extremely tough, but can also take 2 actions on each turn. Considering the relative difficulty of making a clean kill with only standard units, the first team to upgrade a unit to a Demon will have a significant advantage – in fact Demons can often break the enemy lines singlehandedly, especially if there are more cavalry/archers than infantry. 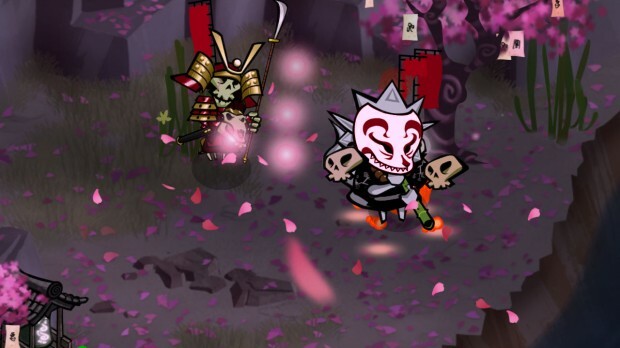 Prior to becoming a Demon, each skull consumed by a normal trooper will add +2 to their maximum HP (up to a maximum of 12) so despite the fact that consuming skulls (instead of attacking) appears to place a unit in danger, it generally means that they can absorb the equivalent of 1 attack, so it is a worthwhile strategy if you can balance the risk/reward. It’s certainly worth knowing (from a prioritisation perspective) that if one of your units has already consumed 2 skulls and you have to choose between eating a 3rd OR finishing a weakened enemy, then contrary to what we said earlier, you should ALWAYS eat the skull. Why? well that’s easy, because the Demon unit upgrade happens immediately, allowing the unit to take a second action right away – so you can in fact upgrade the unit by eating the skull AND attack and kill the enemy unit in the same turn. It should go without saying then that if an enemy unit has 2 skulls already; you should do whatever is reasonably possible to ensure that unit does not receive a 3rd. This might not always mean kill the unit at all costs, but it does mean you should withdraw any weakened units to ensure that they are not killed for their skulls! One thing to note about skulls is that your team can only consume either enemy skulls, or those which have been cleansed. Only your enemy can consume the skulls of your fallen troops. The game explains most of that, so the reason we’re mentioning it here is because the game doesn’t discuss how cleansing occurs. Fox Monks can do so, although you probably won’t bother with that much, but cleansing also occurs another way. If an enemy who has consumed the skulls of your units is killed, he will drop not only his own skull, but also those of your fallen comrades. These skulls are considered to be cleansed and can therefore be eaten by any unit. As a general rule of thumb then, you have an added incentive to kill enemies who have consumed skulls (and protect your own troops in the same situation) and at the same time, if you have to choose which skull to eat (between an enemy skull and a cleansed one) then you should always choose the cleansed one. Why? Because if the ground is littered with enemy skulls and not cleansed ones, then your enemy cannot consume them and gain strength, but you can! As the games hint system will explain, all Generals will generally begin each battle in meditation mode. Whilst remaining thus, a General will gain +1 to maximum HP at the start of each turn (to a maximum of 18); it is therefore in your interest to maintain meditation mode for as long as possible. That said, from the first boss fight until the end of the campaign (and in all multiplayer modes) the General is the only unit that begins each battle with the ability to take two actions (rising to three in Demon mode) so he has a significant combat advantage and/or can become a Demon in as few as two turns once awakened, if there are enough consumable skulls nearby. Here at XBLA Fans, our advice is only this: try to ensure that your General has a clear route to his maximum 18 HP within 1-2 turns before awakening him and most importantly, get him into Demon mode as a priority once he is awake. A demon General supported by 1-2 other Demon troops is the equivalent to having 2 or more Queens in chess – the enemy will almost certainly succumb very, very quickly. The final note here is that you must remember that even an 18 HP General will die if he loses all 18 HP. That means you lose the game. To prevent this, it’s worth a quick reminder that even once his max HP of 18 is hit, the General can still consume skulls or green potions to regain his current HP, even though there is no further benefit to max HP. You might want to save those skulls to make more Demons, but if your General is in trouble, prioritise his survival at all costs!